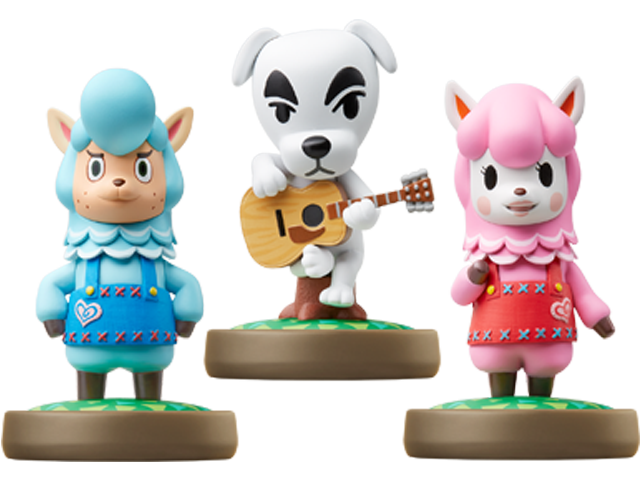 Three Great Animal Crossing amiibo in One Pack! K.K. is a wandering musician—who occasionally moonlights as DJ K.K.—from the Animal Crossing™ series. In Animal Crossing: New Leaf, you can request your favorite hit during his live concerts held every Saturday, and he'll give you a recording of the song to take home as a memento. The mayor's secretary, Isabelle, apparently has a big crush on him. Who could blame her? K.K. is compatible with several games. Click here for details. Reese is a pink alpaca who runs the Re-Tail recycling shop along with her husband Cyrus in Animal Crossing™: New Leaf. She sells all kinds of secondhand goods, so go to her if you want to get a good deal for last season’s furniture or the prized beetles you caught on the island. Reese is compatible with several games. Click here for details. Cyrus is a blue alpaca and husband to Reese, and together they run the Re-Tail recycling center and shop in Animal Crossing™: New Leaf. Bring him furniture you'd like to customize and he'll give you several options—change the color, make a music box, shrink fossils…just don't go making goo-goo eyes at Reese while you wait for him to finish his handiwork. Cyrus is compatible with several games. Click here for details.